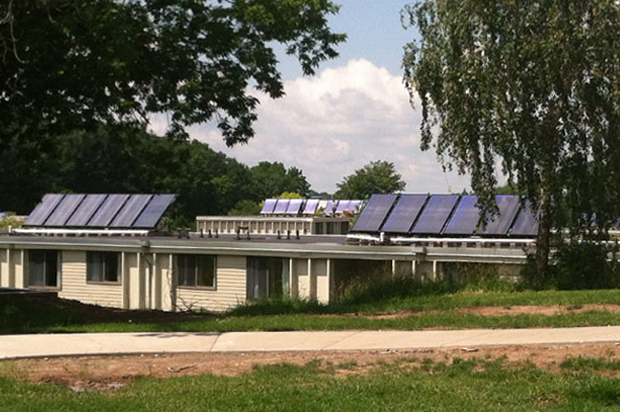 Syracuse University installed 20 solar thermal panels on South Campus apartment buildings in 2013 to provide domestic hot water. When someone mentions the word “sustainable,” what comes to mind? Is it the environment? Is it your family? Is it your finances? Sustainability can take on many different forms. 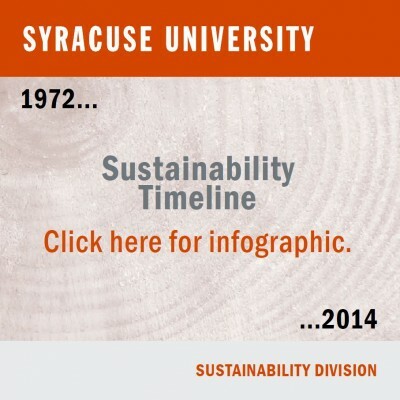 At Syracuse University, sustainability means identifying and promoting sustainable practices that reduce the University’s environmental impact in an economically responsible manner. That’s the mission of the Sustainability Division. Not an institution to stand still, Syracuse University recognized the need for, and potential impact of, a campus sustainability division. This recognition was due in part to Chancellor and President Nancy Cantor’s decision in 2007 to sign the American College and University Presidents’ Climate Commitment (ACUPCC), but it also continued a long tradition of energy management and conservation at Syracuse University, dating back to 1972. The following year was marked by long lines at gas stations, as the nation was on the cusp of an oil embargo that had many people thinking about better ways to conserve energy. Cadwell says the Sustainability Division is currently administering the Climate Action Plan (CAP). The CAP sets the institution’s short-term and long-term strategies, targets and goals for achieving carbon neutrality; in addition, it provides a blueprint for implementing carbon-neutral initiatives as part of University operations. (Faculty, students and staff are invited to submit greenhouse gas emission reduction projects and suggestions to the Sustainability Division at sustain@syr.edu). Additionally, the Sustainability Division is partnering with other campus groups and departments to raise awareness and spread the word about sustainability principles and initiatives. The message emphasizes simple changes that individuals can make to help the University achieve its goal of carbon neutrality. These changes include new ways of working, traveling and saving energy. They also include traditional conservation approaches, like thinking globally and remembering to reduce, reuse and recycle.